Stop children from falling out of windows. 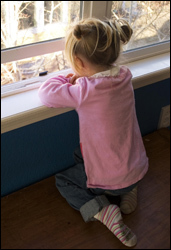 Every year approximately 5,000 children fall out of windows in the US. For parents nothing is more important than the safety of our children. A most horrifying sight for parents is to see their child lying hurt and unconscious on the ground below. Still, every single year news reports tell of children who have fallen out of apartment and house windows. These children have been seriously injured, slightly injured, or worse. Within this year alone I've seen two separate news reports in neighboring towns. Finally, now there's a device that allows us to keep our windows open and our children safe. Hi, my name is Christian. I'm the inventor of the Lock-it Block-it. The Lock-it Block-it is a highly effective safety device designed to protect children from falling out of windows. The Lock-it Block-it sits in the window track, out of reach of children, and adjusts so that parents can keep their windows open and keep their children safe. "Every year we see cases…of children pushing out screens and plunging from windows. If the children survive the fall, the injuries that they suffer often require surgery, long healing times, and physical therapy. This is a high price to pay when the incident could have been prevented." Every year in the United States nearly 5,000 children, mostly toddlers, fall out of windows. Approximately 28 percent require a hospital stay and approximately 20 die. More than 2.5 million children are treated in emergency rooms for fall-related injuries. This has to stop. Preventing accidents before they happen is the key. What's difficult is that while open windows pose a fall hazard for children, windows can also serve as emergency escape routes in cases of fire. It's important to reduce the risk of falls, but authorities don't want parents to install bars that can't be detached quickly in the event of an emergency. It's also important for families to enjoy the comfort of their homes and their windows open. When small children are present, close and lock windows. If you need ventilation, open windows that are out of reach of children. Install window guards or window vents if you are unable to teach your children to stay away from them. Do not place furniture near windows. Don't allow children to lean on screens and windows. Do not allow roughhousing near windows and patio doors. 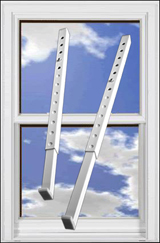 Our mission is to provide a safety device that allows people to keep their windows open at a safe height and prevent children from falling out of those windows. The Lock-it Block-it is a safety device does just that. Finally there's a solution for upright windows that replaces those wooden blocks that fall out when the window is lowered. Wood blocks are ugly. They don't adjust. They fall out of upright windows. The Lock-it Block-it stays in place, held firmly by strips of Velcro. When properly placed in the window track or on the window sash, with the head firmly butted up against the top window frame, the Lock-it Block-it blocks the window from opening beyond the set point. According to the safety experts, 4 inches is the maximum height a window should be left open in order to prevent children from falling out. The Lock-it Block-it is easily adjustable to meet that requirement. With the push of a button, you can adjust windows to remain open as little as one inch or more. Toddler can't reach the Lock-it Block-it. Made of reinforced plastic, it can't be broken by a child banging the window against it. The strength, placement, and adjustability of the Lock-it Block-it makes it superior product compared to other products on the market. Using window guards and bars require you to screw them into the window. One screw will make the window warranty invalid. You've also defaced the window which will have resell consequences. If you rent, you'll have to pay for the damage from your security check. I wanted a product that I could have complete confidence in. I searched the market and found some products that were okay, but not great. They didn't convince me that they were absolutely secure. Seeing this, I invented the Lock-it Block-it. Other products don't give the same amount of security. They jam, break, and can be easily removed. There is no window safety / security device that is perfect, but the Lock-it Block-it is one of the best products in its category according to security experts who have tested the product in numerous homes. Upon an inspection from a police officer who did an in house evaluation of my home, he said "I would definitely use that device. The one I have in my window is much more flimsy." Police officers can't give direct recommendation, but receiving their approval is a huge boost for the Lock-it Block-it. The safety of children and families is important to us.